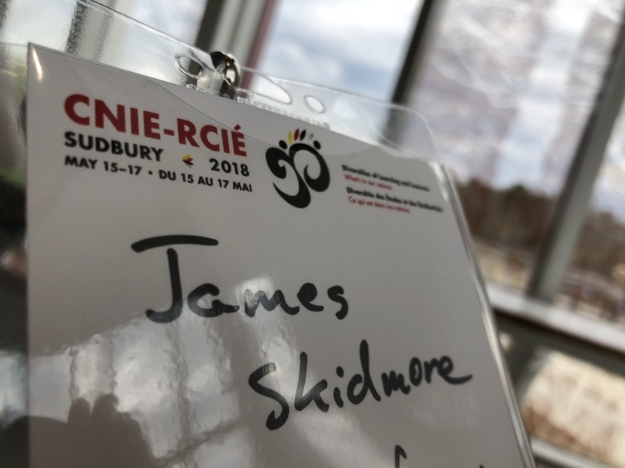 The annual meeting of the Canadian Network for Innovation took place in Sudbury last week, and I attended in my capacity as one of the eCampusOntario Open Education Fellows. I presented as well on efforts to open up educational resources in the humanities, but I was more interested in discovering how the conference would meet the expectations of its theme, "Diversities of Learning and Learners: What's in Our Natures." A statement like that can mean nothing or everything. In this instance, however, I think it worked. There is a great deal of diversity in educational innovation, much of which was on display at the conference. A couple of themes emerged that I'd like to highlight here. Numerous presentations advocated more learner input into the organization of their learning. Melissa Jakubec from Thomson Rivers University introduced two courses in which students aren't required to proceed through the term in lockstep, but can choose the order in which they do their readings, assignments, etc. Another topic of conversation centred on giving students more control over the assessment process, an idea that was of interest to a great many attendees. Assessment models in which learners can submit a portfolio of their assignments for grading sparked interest, as did the notion that the time has come for hybrid models where grade-less assignments become part of the assessment package. Approaches such as these reflect the growing interest generally in fostering better student engagement with learning; one example is a recent column in The Chronicle of Higher Education by David Gooblar who runs Pedagogy Unbound. That there was a lot of talk about how to develop instructors' teaching skills isn't a surprise, given that so many attendees at CNIE 2018 were instructional developers at higher education teaching centres. A presentation by Saul Carliner of Concordia University really hit the nail on the head. Everyone knows that the vast majority of regular faculty members don't attend the professional teaching development workshops offered at universities and colleges across Canada. The question is why don't they? Carliner offered a two-part answer. In his research, he has found that most faculty members think they do a pretty good job teaching. As a result, since the emphasis at universities is on research, instructors resist spending valuable time on something at which they are competent, when using that time for research will yield them more rewards. It's a more nuanced answer to this question, and it reflects the lack of informed reflection that faculty members put into their teaching. Innovation necessarily demands that you stand outside the norm and approach your work from new directions. Gallagher's statement reminded me that when you're bumping up against obstacles or problems in your teaching, you need to step back and see if you can come at the problem from a different angle. This isn't anything new, and it certainly isn't rocket science, but it is a useful reminder of how innovation is really just a part of two key processes in both teaching and learning, namely reflection and revising. During his talk on the Ontario Extend program, eCampusOntario Executive Director David Porter (winner of the CNIE Leadership Award for 2018) talked about how eCampusOntario is modelling its work on the anatomy of the 21st-century educator, an idea formulated by Simon Bates at UBC. An educator juggles various roles, and that can be daunting; you might think you may have failed if you don't excel in all aspects of this educational persona. But I like the impetus for educators to approach their work with these skills in mind. 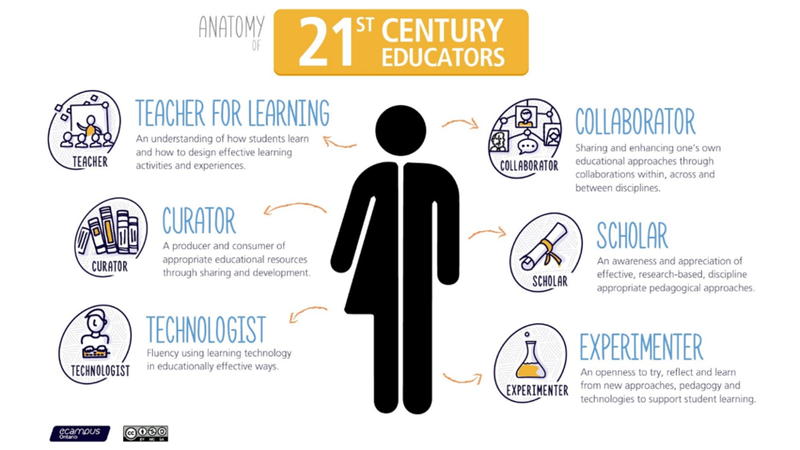 I'm critical of parts of this diagram; for example, I believe educators in higher education should be actively pursuing the advancement of human knowledge, and I don't see that adequately reflected in the schema above. But on the whole it works well at encapsulating the challenges of educating in the 21st century, challenges of which presenters at CNIE 2018 were well aware.